Our Kayak Excursions allow your small group to enjoy a day on the water kayaking from your chosen Drop Point Destination back to Tilghman Island Marina at your own leisurely pace. Stop along the way to take pictures, swim, picnic lunch, search for seaglass and driftwood or relax with a short snooze on any of the many remote beaches. 1.) Harbor Cove - Located about 4 miles north of us along the shores of the Chesapeake Bay. This Drop Point Destination offers Kayakers the ability to explore the Bay's shoreline with its abundance of remote sandy beaches, natural salt-flats and awesome architecture. As you pass through Ferry Cove you'll find a small marina with Tiki Bar and restaurant (Lowes Wharf) offering the opportunity for drinks & lunch on your way back to Tilghman Island Marina. 2.) Waterhole Cove - Located about 4 miles northeast of us along the shores of Harris Creek. 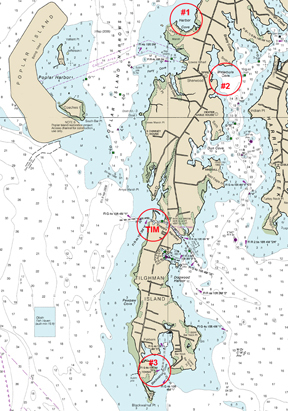 This Drop Point Destination is about the same distance as Harbor Cove however there are many more nooks and crannies to explore along the way back making it the longest paddle. Fully exploring the perimeter of Waterhole Cove and Dun Cove can easily add several extra paddling hours to your day. The shoreline of both as well as the route back to Tilghman Island Marina are a mix of natural salt-flats with an abundance of wildlife, remote sandy beaches, farmlands, quaint cottages and impressive estates. 3.) Blackwalnut Cove - Located at the southern tip of Tilghman Island, just 3 miles south of the Marina. 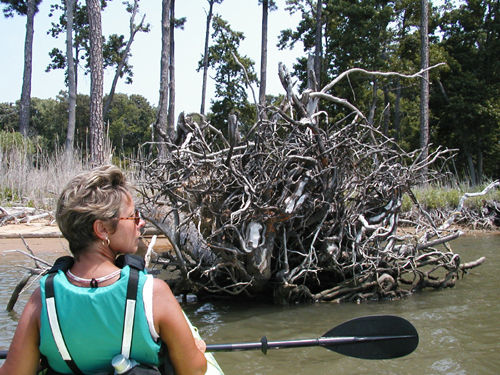 Although this Drop Point Destination offers the shortest paddling distance, it allows you to choose your return trip along the east or west side of Tilghman Island. Both sides are similar in that both offer sandy beaches for swimming or picnic lunches, abundance of wildlife, awesome architecture and views of local Waterman at work. The west side paddle along the shores of the Chesapeake Bay is about 2 miles longer than the east side which runs along the shores of the Choptank River. 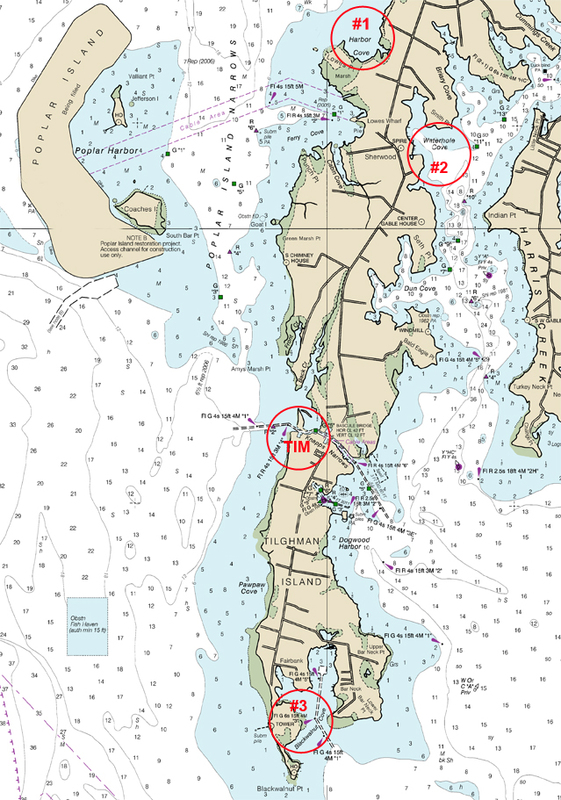 Returning along the east side allows a paddle through Dog Wood Harbor, home port for several historic Sailing Skipjacks. with using to make navigation more certain.